Life as a student athlete was challenging for Melbourne Vixens defender Jo Weston – but with unfaltering passion and perseverance she made it work. Having just returned from her first Commonwealth Games, we sat down with Jo to find out how she makes it work on and off the court. For Jo Weston returning from the Commonwealth Games is bittersweet. 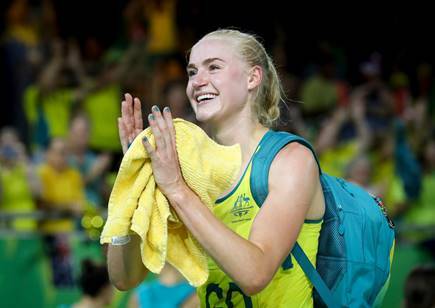 Having played for the Melbourne Vixens since 2014, this year she realised a childhood dream when she joined the Diamonds team for the Commonwealth Games. Sadly, the team suffered a crushing defeat to England. But the talented defender sees the silver lining. “Although we didn’t win, it was just the most incredible experience,” Jo says. “I felt very spoiled playing my first Commonwealth Games on home soil in terms of just everything being so familiar, having all my family and friends there. Jo receiving her BCom graduation certificate. Having enjoyed accounting in high school, Jo pursued this interest through a Bachelor of Commerce with the University of Melbourne. She graduated in 2015 - but, faced with a hectic training schedule, it wasn’t a straightforward journey. Interstate competitions meant she relied on Summer semesters, online lectures, and a strong friendship base to see her through. Any break during competitions was also put to good use. Following graduation, Jo landed a part-time Analyst job for Deloitte Australia – starting out working with the Private and Business Advisory Services arm. While the mental and physical energy needed to compete in national league netball can be a full-time job, Jo says the league has always been encouraging of its athletes pursuing outside interests. Jo is preparing to return to Deloitte after taking a short break dedicated to training for the Commonwealth Games. After a couple of years on the job, she has an appreciation for how netball has shaped her work. “I’ve loved having this external environment, which is a completely different stimulation to what netball gives me.